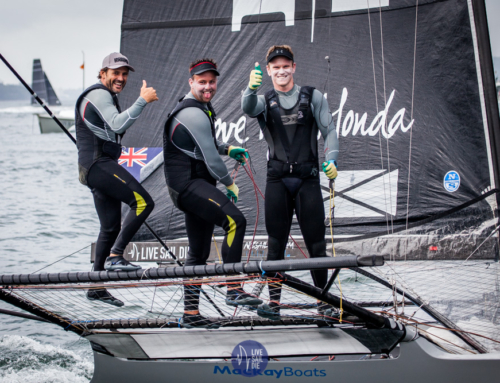 Dave McDiarmid, Brad Collins and Matt Stevens sailing Yamaha, have won the 2016 18′ Skiff NZL Championship by just one point. The championship was run over two weekends and finished up on Sunday 24th January. 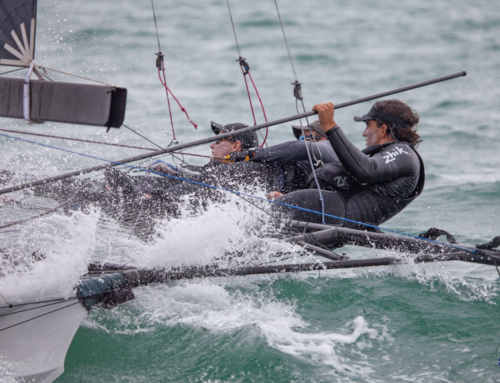 Racing was abandoned on Saturday 23rd due to a complete lack of breeze on the Waitemata Harbour. This meant that only nine of the 12 scheduled races were completed with the fleet allowed only one drop from their series score. “We had a pretty good regatta,” said McDiarmid. “This is the first full regatta that we have sailed together as a team, so we have come a long way in a short amount of time,” continued McDiarmid. “And of course a big thanks to Yamaha for their sponsorship because it wouldn’t be possible without them,” continued McDiarmid. The final day of racing brought everyone together, and although Aon had a awesome day, it wasn’t enough for them to steal the win from Yamaha. C-Tech and Knight Frank finished on 24 points each and tied for third, but it was C-Tech who took the final podium place after a count back. Even though Knight Frank may have finished fourth overall, they won the best start of the regatta having a complete blinder in race eight. The banged the pin end of the line and when the flag was lowered and the start gun was fired, they were within a micro-millimeter of the line totally nailing the perfect start. The fleet have now packed their boats into the Maersk Line containers and are bound for Sydney for the annual JJ’s Regatta.